Succisa Scabiosa. A wild plant in our meadows, with slender stalks, and globous flowers. It grows two feet high. 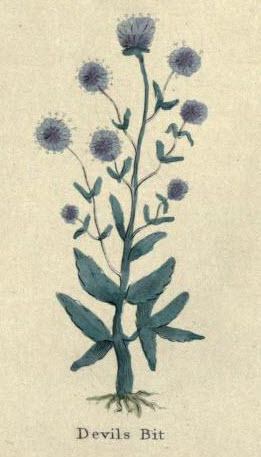 The stalks are round, firm, and upright, and divided into several branches; they have two little leaves at each joint. The flowers are as big as a small walnut, and composed of many little ones; their colour is very strong and beautiful. The leaves which grow from the root are four inches long, an inch broad, obtuse, of a dark green, and a little hairy, not at all divided, or so much as indented, at the edges. The roots are white, and composed of a thick head, which terminates abruptly, as if it had been bitten or broken off, and of a multitude of fibres. The Devil, as old women say, bit it away, envying mankind its virtues. The plant is venereal, pleasing, and harmless. The herb or the root, boiled in wine, is very powerful against fevers, poisons, and bites of venomous creatures: it relieves those inwardly bruised by any casualty, or outwardly by any falls and blows, dissolving the clotted blood; and the herb or root beaten and outwardly applied, takes away black and blue marks in the skin. The decoction of the herb, with honey of roses put therein, is very effectual in inveterate tumours and swellings of the throat, by often gargling the throat therewith: it is an expellant of wind. The powder of the root taken in drink expels worms. The juice of the herb is effectual for green wounds or old sores, and cleanseth the body inwardly, and outwardly from sores, itch, pimples, and freckles, especially if a little vitriol be dissolved therein.